The RSP-3000 Series are efficient 3,000 Watt, enclosed type, switching power supplies with an active power factor correction (PFC) function and are capable of parallel operation. 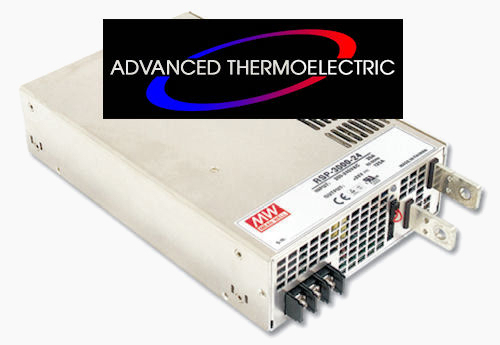 This series are primarily to satisfy the growing demand for high wattage power supplies in industrial and military applications but with a very compact size, uses vary widely. With 15.6 W/in3 of extremely high power density, RSP-3000 can provide full output power in ambient temperatures up to 50 ºC. Quick (±10%) fine-tuning of output voltage can be done by easy to reach rheostat on terminal face plate. There is also a "wide range trimming function" that allows output voltage to be adjusted from 20% to 110% of the rated Voltage by adding 1~5.5V of external control Voltage or resistors. This provides engineers a great deal of flexibility with system design. Having a state-of-the-art circuit design the RSP-3000 series are highly efficient (up to 90%) costing less to operate and can provide 3,000W continuously in ambient temperatures up to 50 °C (122 ºF), or operate up to 70 °C (158 °F) with some power derating. The high power density and 1U low profile saves precious space in equipment packaging. Need to go Big? The Parallel function allows current sharing between up to three RSP-3000s. (Output current in parallel operation = (the rated current per model) x (number of units) x 0.9) That can be well over 6 kilowatts. Applications include front-end power system, factory automation, industrial instrumentation, moving sign, telecom/data-com/signals, laser-carving machines, IC testing equipment, LCD panel burn-in system and battery charging and a host of other industrial and military applications.